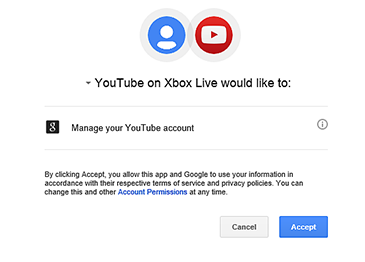 You can sign in to your YouTube account on your console to easily access your YouTube subscriptions and playlists such as Watch Later and Favorites. Before you start you need a YouTube account. If you don’t have one, go to YouTube, click Sign in, and then click Create Account. If you haven’t installed YouTube on your console, install the YouTube app. 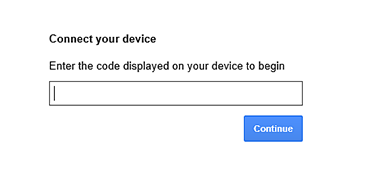 Sign in on your console. On your console, go to Apps, My Apps, and then select YouTube. Select SIGN IN, then select get started. Write down the code that appears on screen. In a web browser, go to YouTube.com/activate. Sign in to your YouTube account, if prompted. Enter the code that you wrote down and click Continue. Click Accept to allow the YouTube app to connect to your You Tube account. Now go back to your console. Your YouTube account is now connected to your Xbox Live account. Now when you use the YouTube app, go to SUBSCRIPTIONS to see your YouTube subscriptions. To see your playlists, go to ACCOUNT and select playlists. ¿Quieres contactar con el Soporte técnico con referencia al problema "Sign in to your Xbox YouTube account on Xbox 360" acerca del que estabas leyendo o con referencia a otro problema?